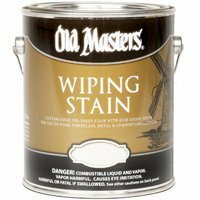 Old Masters 14901 14901 WIP Stain CRIMSON FIRE is for use on wood, fiberglass, metal and composition surfaces and can also be used in wood graining or as an antiquing glaze over painted surfaces. Its thick, rich formula allows easy application and superior color control. For interior use and suitable for exterior use when top-coated with a protective clear finish. Covers approximately 500 sq. ft. per gallon. Spreading rate will vary depending on the porosity and texture of the wood. If you have any questions about this product by Old Masters, contact us by completing and submitting the form below. If you are looking for a specif part number, please include it with your message.